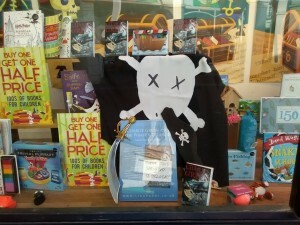 Had a great a day with the team at Waterstones in Worthing on 29th October. Took along all the artefacts I’ve collected (except the cutlass) to illustrate Charlie Green’s journey back in time to find pirates and possibly, not surprisingly, the flintlock pistol created the greatest interest. All the kids had a chance to hold it and see how it worked – they loved it. I really enjoyed chatting and discussing with them how they all worked; the gimballed compass and marine sundial were also particularly handled with interest. One copy of Charlie Green and the Pirate’s Treasure was going to be making a long journey, all the way to Fife in Scotland, as the little girl who bought it was in Worthing visiting relatives. She said she was going to enjoy reading the book on the way home! Thanks to Joel Penny for arranging the event.